Sustainability or the “substitution principle” is focused on the substitution of a product, service or process to another that is more efficient or beneficial in some way while retaining the same functionality. The prominent substitution nowadays is replacing a product, process or service in order to better the environment…. 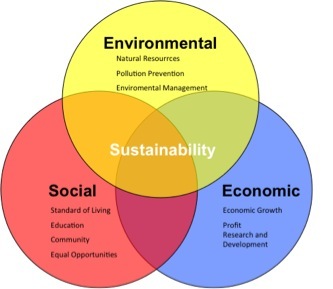 It is also widely agreed that the term “Sustainability”, as we use it today in business can be traced to the coining of the term “sustainable development” at the 1972 UN conference in Stockholm – 1972!. That is how recently we, as a society, began to understand that employing strategies and materials that endure (or are sustainable) and reduce the waste created in production or disposal can actually save money and even create new revenue streams. David Zielski is an accomplished and well rounded leader with over twenty years of diversified business development, marketing, and management experience within start-up ventures in telecommunications, broadband Internet, sustainable consumer products and the fashion industries.